Aaron Rodgers ran for a touchdown and made a saving tackle, B.J. Raji returned an interception for a score and Sam Shields had two interceptions to lead the Green Bay Packers to a 21-14 win over the Chicago Bears in the NFC championship game Sunday. The victory sends the Packers to the Super Bowl in Dallas to meet the winner of the New York Jets-Pittsburgh Steelers AFC title game later Sunday. 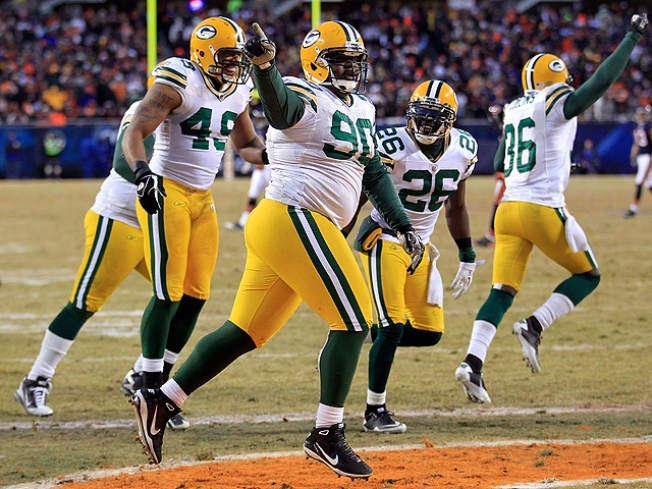 Raji's TD return in the final quarter put the Packers up 21-7. Green Bay then withstood a rally led by Chicago third-string quarterback Caleb Hanie. He led two fourth-quarter TD drives, but Chicago's last chance to tie the game ended in the final minute when Shields came up with his second interception in Packers' territory. Bears starter Jay Cutler hurt his knee and played only one series in the third quarter. The sixth-seeded Packers have now won road games in Philadelphia, Atlanta and Chicago. The Packers won this 182nd meeting of the NFL's most played rivalry and will be playing for the Vince Lombardi Trophy - named for their former coach - in their in fifth Super Bowl. Rodgers and James Starks had short scoring runs in the opening half as the Packers built a 14-0 lead. In the third quarter, Rodgers went back to work, connecting with Jordy Nelson for 21 yards and Greg Jennings for 20. After a pass interference call on Chicago's Tim Jennings, the Packers had a first down at the 8. But on third-and-6, Bears star linebacker Brian Urlacher intercepted a pass by Rodgers and had just the QB to beat for a long TD return. But Rodgers got in Urlacher's way and grabbed just enough of his legs to pull him down at the Bears 45. The Bears couldn't muster much of anything offensively. Cutler was having a rough afternoon, going 6 for 14 with 80 yards and an interception before Chicago turned the offense to the little-used Collins. It wasn't immediately apparent when or how Cutler got hurt. Collins lasted two series before he was replaced by third-stringer Hanie. Rodgers started where he left off last week against Atlanta, throwing passes of 22 and 26 yards to Jennings to open an 84-yard drive on the opening series of the game. He later hit Nelson with a 22-yarder to the Bears 2, then ran in from the 1 on a bootleg after withstanding a hard hit from safety Danieal Manning. And just like that, the Packers were ahead in the first four minutes. Taking the ball at the Bears 44 after forcing Brad Maynard to put out of his end zone, the Packers moved in again early in the second. Rodgers got off a nice dump pass under pressure to Brandon Jackson and the running back made a beauty of a fake to go right past Urlacher and gain 16 yards. Starks then broke off a 12-yard run before Rodgers found Nelson for a 15-yard gain to the 4. The rookie Starks carried right and weaved his way over the goal line, putting the Packers ahead 14-0 with 11:13 left in the half. Rodgers was 10 of 15 for 156 yards and an interception in the first half. The Bears got their offense moving midway through the second quarter but still couldn't score. Cutler had a 24-yard pass to Johnny Knox and then found Chester Taylor for 12 more, carrying to the Packers 30, their deepest penetration of the game. But the drive stalled after a completion was wiped out by a holding penalty and two carries by Cutler. Instead of trying a long field goal, the Bears punted again and Maynard's kick went over the goal line into the end zone. Rodgers couldn't find an open receiver on second down and took off for a 25-yard gain to the Bears 45. Chicago's defense dug in and stopped Starks on a third-and-1, forcing a Packers punt. Shields forced a Cutler fumble with just under two minutes to go - the Bears' Matt Forte recovered - but once again Chicago had to punt. Finally, the bundled up predominantly Bears crowd had something to cheer when Lance Briggs intercepted a pass from Rodgers intended for Donald Driver with 48 seconds to go. But after a pass to Forte gained 17 yards, Cutler's long heave for Knox down the sideline was picked off by Shields near the goal line with 32 seconds left. The Packers and Bears met only one other time in the postseason, a 33-14 win by Chicago in 1941, shortly after the bombing of Pearl Harbor. After splitting two regular-season games - the Packers beat the Bears 10-3 in the finale just to get in - the hype for this matchup overflowed all week. Green Bay got in as the sixth seed and behind the play of Rodgers, went into Philadelphia and Atlanta for impressive victories. Rodgers had 366 yards passing and threw for three TDs in Green Bay's surprisingly lopsided 48-21 win against the Falcons.